I picked up Dying Light a few months back from GameStop as I'd been interested in it for quite some time. But none of my friends had it, and I hadn't really heard anything about it, so it slipped to the back of my mind. I've only had the game a little over a week, but it has already taken its place among my Top 10 favorite video games ever released. This isn't a review of Dying Light itself, though, so I won't go into a full detailed review: suffice to say, I think it's the best zombie video game made to date. The Bozak Horde is... well, it's unusual. The developers basically take everything you've learned in Dying Light, and turn it upside down. 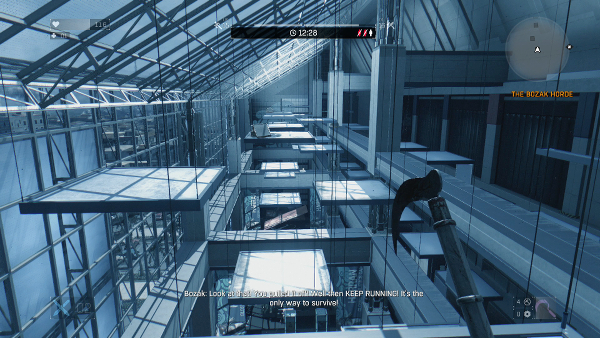 Gone are the sprawling urban streets where you can freerun your way from one corner of the map to the other without ever touching the ground. Gone is the "run when you can, fight when you must" attitude. Gone are the complex, interesting characters; gone is the deep, involving story. I applaud the developers for trying something so drastically different within their game, but unfortunately, The Bozak Horde ultimately feels like a rather big step back. By far, the most defining feature of Dying Light was its story. It was introspective, dealing with interesting characters and exploring how real humans might react, adapt, and survive in a world overrun by zombies. The story was the package that enveloped, and in a way justified, the parkour and combat elements. It was a vast improvement over Techland's previous zombie game, Dead Island, which felt sloppy, had no real story to speak of, and was presented as a fairly lightweight and brainless (no pun intended) romp through an island resort. The Bozak Horde, regrettably, regresses to Techland's Dead Island roots. Which isn't really a good thing. When the game strips out the story and forces you to fight, Dying Light's biggest flaw really become evident. The combat system isn't designed to be your first line of defense: going toe-to-toe with a horde of zombies is usually a surefire way of finding your way back to the last checkpoint. It's a fairly clunky combat system, and hand-to-hand combat often feels like trying to slap a zombie with a large kielbasa. But Bozak Horde insists on locking you in a confined space with a horde of zombies (something that rarely happens in the full game), and expects you to do a lot of fighting with terrible weapons. Which means that you, as the player, are constantly fighting the limitations of the combat system—perhaps more than you fight actual zombies. Additionally, after installing The Bozak Horde DLC, the rest of the game (on Xbox One) suffered from framerate stutters and occasional slowdown. I have not yet been able to determine if the DLC specifically caused these problems, or if it's purely coincidental. As I had a ton of time in the game before installing and playing the DLC, not much time actually spent playing the DLC, and I noticed the lag after returning to the normal game world, it suggests the DLC is to blame. A lot of people have complained that The Bozak Horde is simply too difficult to be fun. It is very unforgiving, but I don't think it's unreasonable. You will need two things to succeed: (1) a good team of high-level players who know what they're doing; and, (2) a lot of patience to learn where you're supposed to go and what you're supposed to do for each 'trial' in the challenge. Unfortunately for number one, the number of people playing Bozak Horde has dropped significantly: most likely, people thought it was too hard, or that the reward—a bow and arrow—simply wasn't worth the time or effort expended to complete the DLC. Unfortunately, I would have to say if you haven't already purchased the Dying Light Season Pass, The Bozak Horde isn't really worth buying. It strips out all of the fun of the open-world exploration and pigeonholes you into a dingy parking garage, and leaves you struggling to compensate for its less-than-fantastic combat system.